I recently bought a new mount for my GoPro Hero 3+ Black Edition, it’s called the Jaws Flexible clamp mount and it’s basically a sturdy clamp with a standard GoPro mount built in, and an adjustable section made up of sections of hollow plastic with GoPro clips on each end. 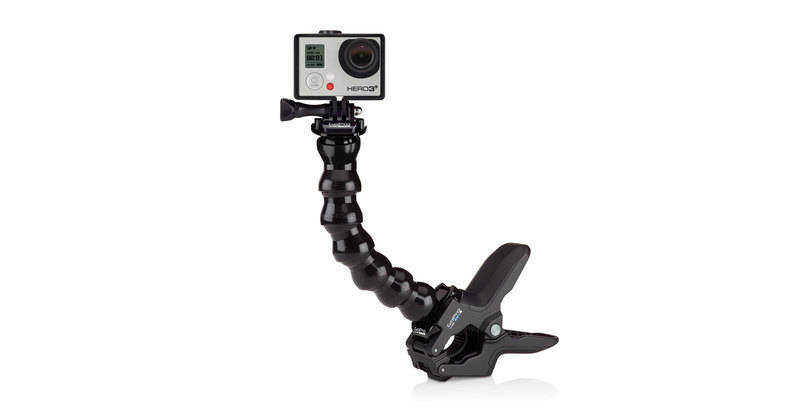 Clamp your GoPro to objects ranging in size from .25″ to 2″ (.6cm to 5cm) in diameter. Attach your camera directly to the clamp for low-profile mounting, or use the optional neck to achieve a wider range of camera-angle adjustability. Jaws securely grips irregular shapes and super slim objects thanks to its innovative design. The first thing I did once I had it was set about extending the flexible “neck” section, turns out it’s a mass produced hose system produced by a company called Loc Line, the end sections are specialised GoPro clips but because of the modular nature of the hose you can pull the sections apart and pop in extra bits very easily. If you’re after the right type of tube you need to get the 3/4″ bore size, you can pick up a 6″ section for around $6 in the US, it’s harder to come by in the UK but I found some on eBay for about £15 a foot, that’s plenty for what I want to use it for. When I get a chance to use it to shoot some surf footage or stills I’ll put up another post here, but I’m sure it’s going to be a really useful mount for shooting time lapses when I’m on holiday next month. 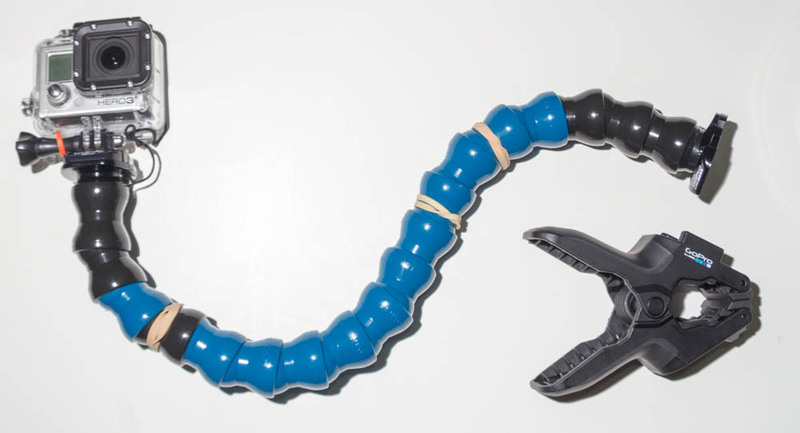 What are the rubber bands for? I use a shoe lace to attach the camera to my board, just in case the camera becomes detached somehow, the rubber bands just stop the shoe lace flapping around and getting in the shot. No problem, I’ve used it a bit recently so will do an update on how it works at some point too. Heythanks a bunch for the tip! I longboard and just am getting a gopro. Because I longboard, mounting the suction on the nose is not really the best option (noseriding). Has anyone tried the jaws on the nose of their longboard? Does it come off, and also, does it leave pressure dings in the board? Thanks. I haven’t tried it on a longboard, and I don’t use the jaws clamp part at all even on my soft board, I just use the extended tube section to lift it off the board a bit. The clamp is quite powerful so I’d expect it could easily leave a pressure dent on a fibreglass board, if it’s a soft board or sandwich epoxy it shouldn’t be an issue, but there are definitely better ways to do it. I’d suggest using some kind of mouth mount, or just hand holding a grip that you can hold in your teeth when you take off, otherwise you’ll need to attach something permanently to the board to get a decent shot.